The Apnea Monitor is designed for use on adults as well as neonates. Small, compact and reliable, this instrument is very simple to use. A mini sensor is strapped on the patient’s chest/abdomen. As the subject breathes, LED flashes give indication of the respiration rhythm. When the Apnea period exceeds the preset value, an audio-visual alarm is given. The Apnea period can be set at 10,20,30,60 or 120 seconds by a 5-way Rotary switch. 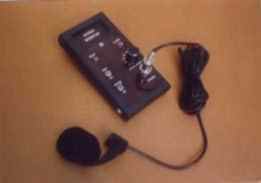 The Apnea monitor can be used on Battery; or, mains power supply. Sensor system : Mini-opto-sensor on chest/abdomen. Electronic System : I.C. solid state. Apnea Control : Adjustable by 5 -way rotary switch to pre-set Apnea periods of 10, 20, 30, 60 or 120 seconds. Power Requirements: 220 or 110 volts / 50 cycles ; or, 9 volts Battery/ D.C. supply. Power consumption : Less than 1 watt. Size/Weight: 16 x 9 x 5 cms/2 Kg.